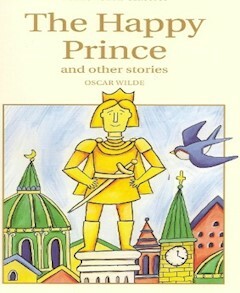 The Happy Prince and Other Stories is a collection of stories for children by Oscar Wilde. It contains five stories, "The Happy Prince", "The Nightingale and the Rose", "The Selfish Giant", "The Devoted Friend", and "The Remarkable Rocket". It is most famous for its title story, "The Happy Prince". In a town where a lot of poor people suffer, a swallow who was left behind after his flock flew off to Egypt for the winter meets the statue of the late "Happy Prince", who in reality has never experienced true happiness. Viewing various scenes of people suffering in poverty from his tall monument, the Happy Prince asks the swallow to take the ruby from his hilt, the sapphires from his eyes, and the golden leaf covering his body to give to the poor. As the winter comes and the Happy Prince is stripped of all of his beauty, his lead heart breaks when the swallow dies as a result of his selfless deeds. The statue is then torn down and melted leaving behind the broken heart and the dead swallow. These are taken up to heaven by an angel that has deemed them the two most precious things in the city by God, so they may live forever in his city of gold and garden of paradise.